By the strong force of high speed of homogenizer (emulsifier), the materials will go through the narrow space of the emulsifying head, it forms a powerful circulation in the vessel. In the middle part, the center blades and outer low speed anchor rotates in opposite direction. It performs great shearing, impact, and dispersion in the vessel. 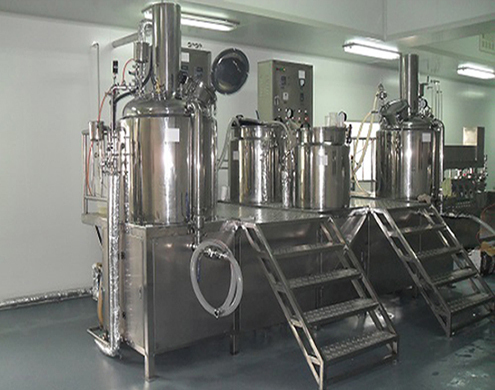 It will help to blend, mixer, emulsify, and homogenize the product in the vessel, and increase the stability, smoothness and luster of cream products. 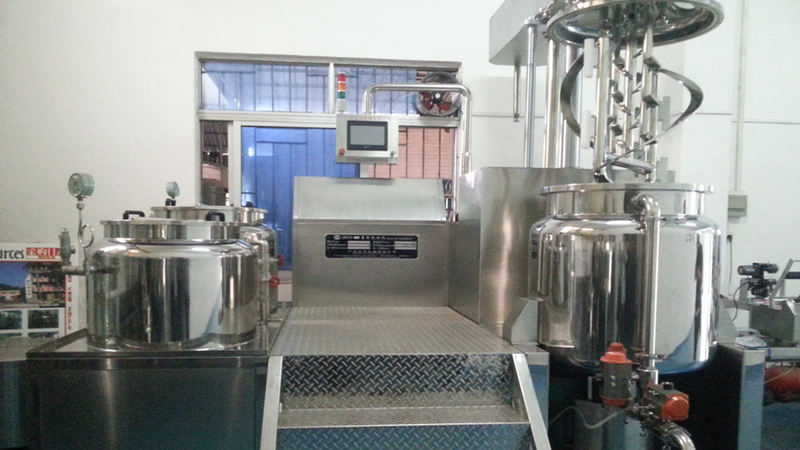 The emulsifying (mixing) head is exchangeable for your various products. 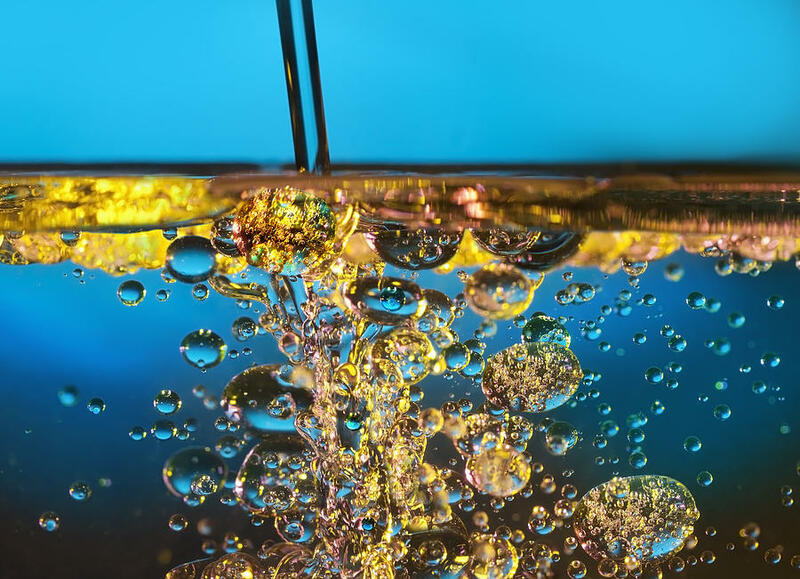 How does production vacuum emulsification equipment work? During the mixing operation, the outer frame agitator rotates clockwise slowly. With the attached Teflon blades, the materials are scraped off the emulsifying tank wall and move upwards so they won’t always stick to the wall and burn. At the same time the inner straight impeller rotates counter clockwise slowly and moves the cream downward into the high speed homogenizing and emulsifying zone. 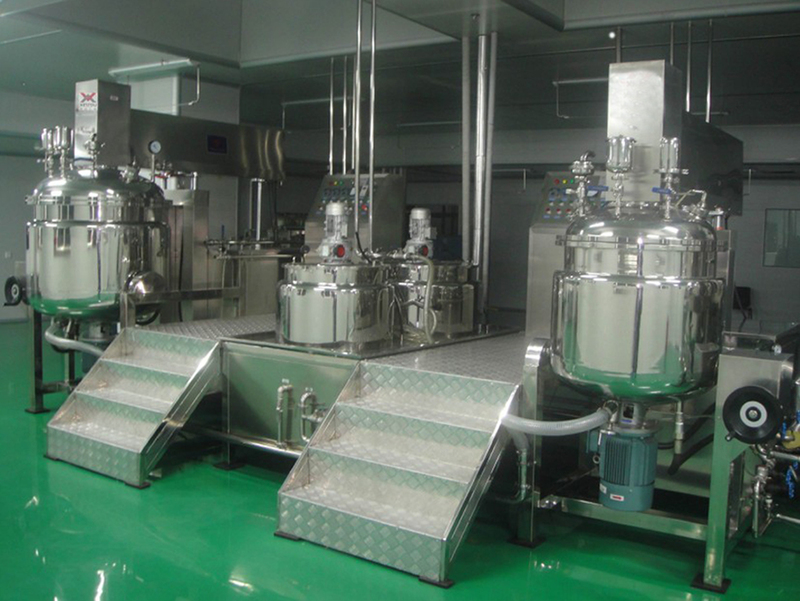 Because of the two opposite forces by center agitator and wall scraper, the cream rolls over the vacuum emulsification blender from top to bottom and back to top repeatedly. When the cream is completely mixed, the heat from the jacket is quickly transferred to every part through the inside wall. 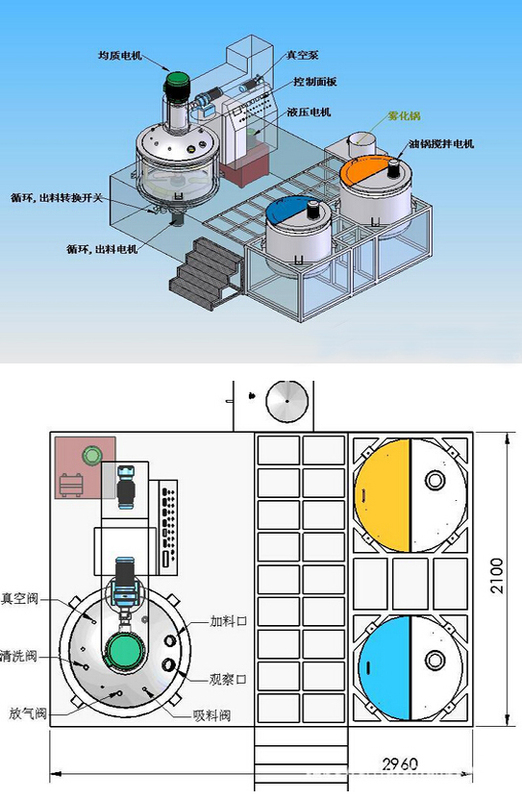 The heart of vacuum emulsification machinery is batch mixer (emulsifier) which consists of one high speed rotor and one holed stator. 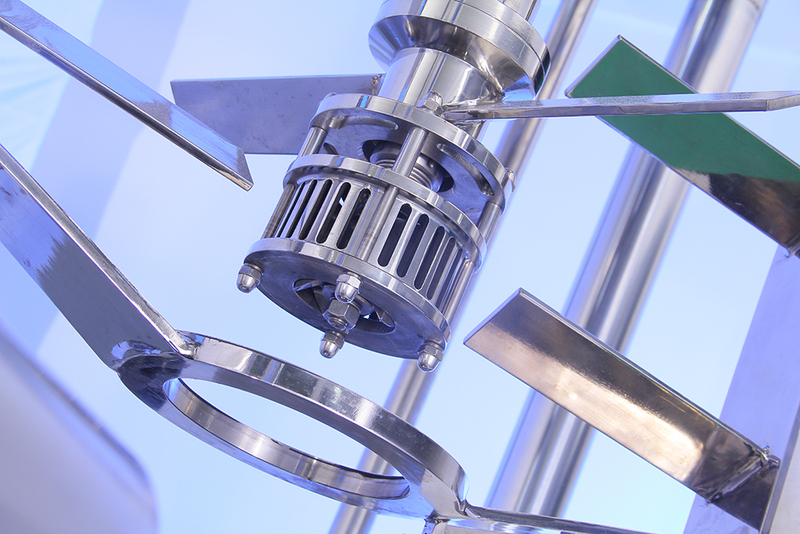 The rotor is driven by ABB or Siemens motor and rotates at the speed of 3000rpm producing strong suction force. The materials go into the rotor from both top and bottom and are cut, sheared, emulsified and homogenized through the shear gap between the rotor and stator. Then they’re accelerated to jet out through the holes on the stator. The above three types of slow and high forces repeat and repeat. And the cream can be circulated inside the emulsification machine and mixed, dispersed, emulsified and homogenized evenly. Water ring type vacuum pump (–0.09Mpa) is powerful to pull out the bubbles generated during mixing, dispersing, emulsifying and homogenizing. 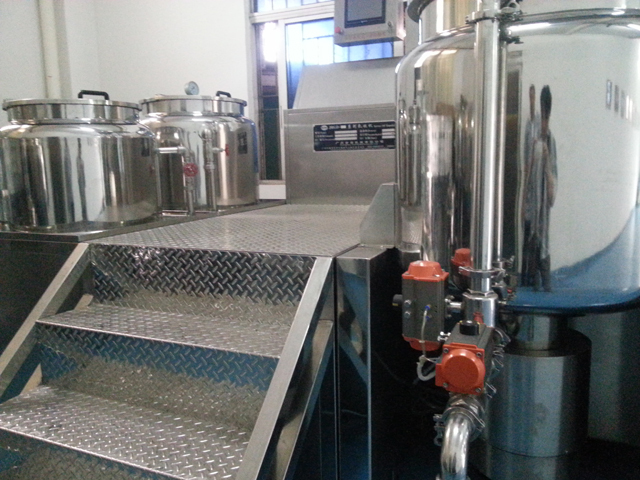 It also helps transfer the ingredients from the oil and water phase tanks to the main emulsification plant. The small quantity powders are also sucked by vacuum to avoid dust. Oil hydraulic pump is used to lift the cover of main emulsification mixer. Safety devices are equipped to guarantee that the mixing part won’t start when the cover is lifted. 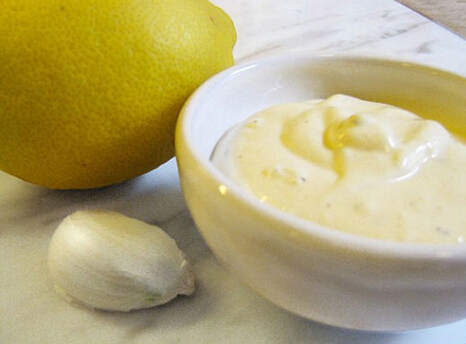 Mark:Mayonnaise is made by slowly adding oil to an egg yolk, while whisking vigorously to disperse the oil. The oil and the water in yolks form a base of the emulsion, while lecithin and protein from the yolks are the emulsifiers that stabilizes it. Additionally, a bit of a mustard may also be added to sharpen its taste, and further stabilize the emulsion. Mustard contains small amounts of lecithin. ]It is a process that requires watching; if the liquid starts to separate and look like pack-ice, or curd, it simply requires starting again with an egg yolk, whisking it, slowly adding the 'curd' while whisking, and the mixture will emulsify to become mayonnaise. If water is added to the yolk it can emulsify more oil, thus making more mayonnaise. wrong operation during warranty period is repaired freely. But the travel and hotel expenses should be count on buyer. leave there untill get your agreement. and they will not leave there until your staff can operate it properly and normally. to the GMP authentication information will be provided by us.